Baby corn pepper stir fry makes for an excellent side dish for parathas, rice, and pulaos. It is low in calories and also makes an awesome low-calorie starter for parties. Wash the baby corn thoroughly, trim the edges off, and cut them in small circles. Set aside. Dry roast the peppercorn and fennel seeds for 3 minutes or until you get a nice roasted aroma. Cool, grind it coarsely, and set aside. Heat oil in a nonstick pan, add cumin and curry leaves. Let the cumin start popping. Add the ginger garlic paste and sauté for a minute. Add the chopped onion and sauté until it turns translucent. Now add the peppercorn and fennel mixture. Add the chopped capsicum, salt, and sauté for 2 minutes. 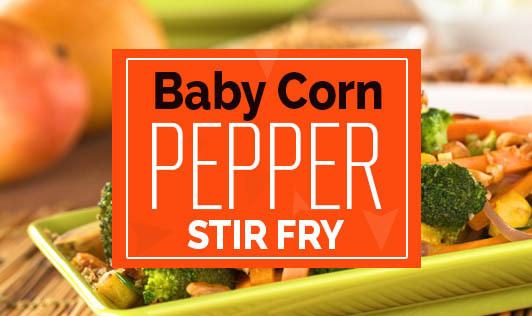 Now add the baby corn, sprinkle some water and cook covered for 5 to 10 minutes. Check in between and flip over to prevent it from burning. Keep cooking until the baby corn turns soft and all the flavors are absorbed. Serve hot with rice or use it as a stuffing.